The name DOUGHTY with its many different variations is an old name, generally supposed to have been derived from the Saxon term DOHTIG, which was an epithet applied to a brave warrior. This name was brought to England in the 5th century AD when the Roman legions had left Britain to defend Rome, leaving its coasts open to invasion from the north western parts of Europe. The Angles, Saxons and Jutes arrived, bringing the name with them. My research has shown that DOUGHTY is still more common along the eastern and south-eastern coasts of England, with the Isle of Thanet, Kent being a good example. There are DOUGHTYs here with lineages dating back a long way., and this is an area that saw many landings of the Saxon tribes. There is often confusion with the Irish names that are very similar, DAUGHERTY, DOHERTY, DOCHERTY, DOUGHERTY etc. but these are all derived from an Irish clan led by chiefs called Dochartaig, "the destroyer". Originally they would have been O'Dochartaig but this name has become the variations mentioned. It is felt that Irish emigrants to America may have chosen to change their name to the more Protestant DOUGHTY variants when they reached the US, or they may just have been illiterate and had their names written differently by immigration officials there. A Jewish friend once told me that a lot of jews in the US are called Ferguson because when they were asked their names on arrival they said "ich fergessen", the German for "I forget". If I am a DOUGHTY, am I descended from Saxons? The answer to this is "possibly"! Surnames for "commoners" were, in all probability, introduced to England by the Normans. Locals would have known each other by their trades or appearances so their fellow villagers may have spoken of John the miller, John the carpenter, John the little or John the dark to differentiate between them. The Normans needed to take stock of their conquered land and this is why the two Domesday books were compiled. They were an inventory of what the Normans could expect to extort from the English! They were called "Doomsday" because the English felt the books meant the end of their world! The second Domesday Book dealt with the fertile farmlands of East Anglia that represented a rich prize for the invaders. To aid this "tax collecting" names of many ordinary people were written down, probably for the first time, so the Shire Reeves could tell who had what and how much they could expect to take from them. Do not under-estimate the malignance and oppression of the Norman's rule over the English. The Britons were just a commodity to be used for slave labour to keep the Normans in wealth and luxury. Any resistance was dealt with by execution, force and destruction. A good example of how the Normans ruled is still found in the English terms used for meat. Words like cow, pig, chicken, deer are British. The words for cooked food - beef, pork, venison, fowl are from Norman French. The Normans only interest in the meat was when it was served up to them. They took no part in its husbandry! The "surnom" was a Norman invention, an added name to identify people more clearly. If a word was in common use it could well have been used for a surname at this time. Some people may have retained family names from generations before, but if they did not have one the Normans could have just given them a "surnom" arbitrarily. If the word DOUGHTY was being used in general conversation to describe a brave person at this time it could have been conferred as a surname! I feel the surnames surviving in areas that were of no interest to the Normans, or were too much trouble to gather taxes from, are the most likely to be authentic pre-Norman names. Almost half were dead by the following year, but in 1661, with the help of friendly Native Americans, they were able to gather in their first successful harvest and it is this event which has become the Thanksgiving Day celebration still observed yearly in the USA on the fourth Tuesday in November . There were many well known characters among these Pilgrim Fathers. 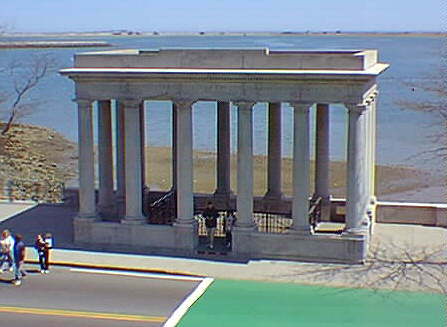 Myles Standish, John Carver, William Bradford are all well known names, but there were others on the Mayflower who did not achieve fame. One of these was Edward DOTY. Edward was possibly just a servant to the captain of the Mayflower, but he did settle with the others. 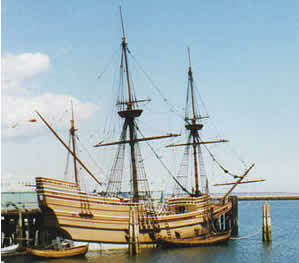 For many, many years American researchers have been trying to trace their lineage back to those who arrived on the Mayflower. There are Organizations and Societies that have been created for those Americans who can prove a link to the families of these first settlers. Edward DOTY's name posed a problem. It was assumed by many that it was a form of DOUGHTY. There are American families still actually named DOTY. Other versions of DOUGHTY emerged in the US, mainly because of their (to English ears) lazy pronunciation. The name DOUGHTY is often pronounced as DOTY, DODY, DOODY, DOOTY even DOTTY etc. and some of these have become alternative spellings. Only in certain cases is it actually pronounced as it is in England - DOWTY, as in the word 'DOWN'. Even this phonetic spelling can cause confusion! A Scotsman or Canadian could easily pronounce this word as 'DOON'! Things are made more complicated by the fact that old, alternative spellings for Edward's surname are DOTTEN or DOTEN. For many years American DOTYs and others with similar surnames have been under the impression that their names were British and still extant in Britain. With the advent of DNA testing a project has been set up to try to prove links between these American DOxxxxTY lines. Some families have actually managed to prove descent from Edward Doty. The Internet has enabled contact between American researchers and the rest of the world . What is the DOTY Puzzle? When I encountered the US DOTY researchers I had not given the subject much thought. Suddenly I discovered that there were all these people avidly trying to find out all they could about DOUGHTYs in the UK! I checked the UK Census records for DOTY. Results were a handful. Two unaccompanied children, possibly of non English parents, a German servant and an American inventor with a French wife! No English DOTYs in the UK! I did the same for DOTEN. One family in the Channel Islands of French descent! BMD records were similarly unforthcoming. One marriage, bride's surname, possibly misspelt! I had to report back that these names apparently DO NOT exist in the UK , or at least not since the start of registration or proper census taking! This must have been quite a shock for the DOTY families and researchers in the US! Many were totally convinced that DOTY was an English name. Apparently, the many DOTY families there had never been able to check this before! Was Edward DOTY actually a DOUGHTY? About this time surname spellings were very varied and there are some early parish records in the UK where the name is given as DOTY. This has led some American researchers to believe these families were the origin of Edward DOTY. At about the same time you can also find DOUTTY, DOUTIE, DOWTY and other variant spellings in UK parish records. These DOTY entries have led to a large amount of dubious IGI input that is, at best, conjecture and, at worst, propaganda by some American researchers who are desperately trying to link their lines with the UK. A recent finding by a serious US researcher has suggested, however that there may be a link with some DOUTTYs shown in parish records in Cornwall. The name DOTEN or DOTTEN is one found in France and Germany. It is possible that Edward was a "foreigner" taken on as a servant. A reference to him being in London has been found and some US researchers feel this could add weight to this argument. Recent research by David Stapp (2010) has suggested that non-conformist religious emigrants had left Lincolnshire for Holland in the early 17th century. It could be that the name Doughty was made more Dutch in pronunciation, leading to DOTY or DOTEN spellings. It could be that Edward DOTY was descended from an English family who had emigrated earlier. Have there ever been genuine DOTY families in England? My research at present shows this to be unlikely. The early DOTY parish record entries were actually for DOUGHTYs. Even if the name was spelt DOTY in early records, later records will show the name as DOUGHTY, or other variants. Was Edward DOTY actually a DUTTON? It is possible that Edward was a DUTTON. Again, DOTEN or DOTTEN as a variant spelling of the DUTTON name could have been the case and there may be English DUTTONs descended from his line. I cannot describe to you the years and years of research that has been carried out in the US trying to solve this puzzle. Agonizing hours spent trying to confirm earlier researchers' findings. Misinformation put about by well-meaning but not very thorough researchers. Hundreds of people desperate to find out whether their roots are English, European or somewhere in between! I am appealing to all UK researchers!